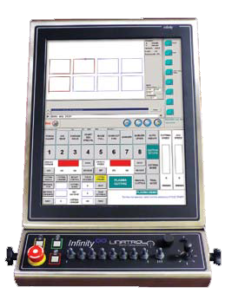 The Infinity∞CNC is a powerful, open-archetecture CNC that seamlessly integrates an intuitive user interface, “real time” motion and process control, a “soft” PLC for I/O control, and CAD/CAM Programming software. the new Linatrol Infinity∞ CNC System! The Infinity∞ CNC comes standard ready to support 4 axis of motion, and has discrete I/O of 48 inputs and 32 outputs. These can be easily expanded by addition of I/O and motion modules, so the system can be customized to meet the requirements of any cutting machine. All I/O is user assignable for maximum flexability. LinatrolCUT Programming Software is installed on each unit, and provides advanced CAD/CAM capabilities via a simple user interface. The process control panel is user configurable to match the target machine, and provides tools for completely automated cutting process control. USB ports, Network port and serial ports make it easy to transfer information to and from the CNC. 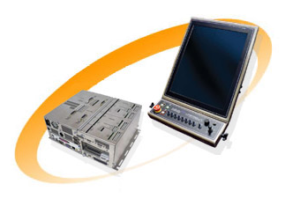 The Infinity∞ CNC is offered with an optional SERCOS interface,as well as popular industrial fieldbus modules for CanBUS, ProfiBUS, InterBUS-S, DeviceNET and our own WesBUS System. The system is offered with an optional Industrial 19” touch screen display and operator console with convenient machine controls including joystick and speedpot. For more cost sensitive applications the CNC can be connected to any standard 19” display, keyboard and mouse set. The Infinity∞ CNC is designed as a scaleable solution, so that the same basic CNC platform can be used on low cost, entry level machines with basic features, and through the addition of software and hardware options the same system can be configured to support high-end machines with extremely advanced features and capabilities. The Infinity∞ CNC is designed for maximum flexibility, and a modular architecture is used to allow you to build the system that best suits your machine application. Start with the basic system and add your choice of servo drives, additional axes of motion or I/O modules, software options to do full automatic nesting, gantry synchronization, or 5 axis transformation beveling. By standardizing on the Infinity∞ CNC as the basic hardware platform, a machine OEM can minimize CNC inventory and support costs, and maximize flexibility! No matter what your machine demands, the Infinity∞ CNC is all you need! LinatrolCUT is a part shape programming, operating and displaying system developed specifically for the CNC. The basic software is installed as a standard feature and allows the user to import CAD files directly to the CNC and easily create cutting programs right at the CNC. A versatile Macro Shape library also makes it easy for a user to make shape-cutting programs just by entering basic part dimensions. Higher efficiency and productivity can be realized by adding optional add-on tools for true shape automatic nesting, CAD tools, and cost calculators for job estimating. The Infinity∞ CNC comes equipped with powerful built-in Diagnostic tools that make installation easy. Tools like A Logic Analyzer with multi-purpose functions allows the user to monitor 8 signals simultaneously. Remote support and diagnostics are possible through Internet connectivity, with no custom software required. 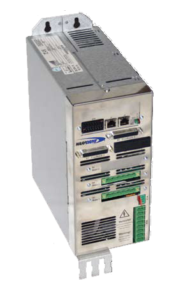 The “soft” PLC employs industry standard IEC-1131 programming language, so custom functions can be easily added to the system as required. The powerful and easy Infinity∞ Setup Utility makes it easy to set the motion parameters, configure the machine peripherals, and assign the I/O for functionality. To maximize flexibility and minimize hardware and wiring costs, we have created our own cost effective industrial fieldbus system … called WesBUS. 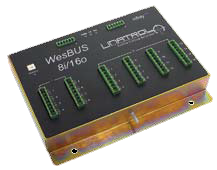 The WesBUS system can support one operator console, and up to 10 I/O modules, each having 16 isolated relay outputs and 8 inputs wi th 12-220V range. Each of the modules are connected with a simple 4 wire cable in tandem connection, so you can use only as many modules as you need for any given machine. Since all of the I/O is user assignable, use the minimum number of I/O modules to support all required machine functions and reduce cost. Need more I/O in the future, just plug in an additional I/O module and assign the extra I/O … it is that easy ! The Infinity∞ CNC, display, console and I/O modules are all made to stand up to the harshest industrial cutting environments … with strong stainless steel enclosures that are built to last! Linatrol provides the best highly trained, dedicated, full-time support available for cutting machine control systems. With proven reliability and a comprehensive extended warranty program, we make sure your machine is running and doing what it is supposed to do … making money for you! Down-time is the last thing you will need to worry about! 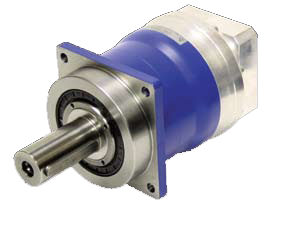 The Infinity∞ CNC readily supports many servo drive options, so it is compatible with most systems in service today. AC or DC, Analogue, Digital or SERCOS, all are supported and easy to setup. Team up the Infinity∞ CNC with an y Linatrol Servo System, like the proven HL75/76 DC drive package, the ACcel brushless AC servos, or the new Digital AC Warp Drive system … with a complete Linatrol System your satisfaction is guaranteed !